A lot of people make fun of Californians for their inability to handle temperature swings. It is true – our delicate natures can only be kept happy and non-complaining within a very narrow temperature band. Depending on who you talk to, it might be the ten degrees between 60 and 70, and maybe for others the band between 65 and 75. Stray too far from those ranges, and you are sure to be witness to complaints of the “extreme cold” or “overwhelming heat”. However – do not be fooled – it can and does get seriously hot here some times, and Saturday was one of those days. The extreme temperature swing brought on by the Santa Ana winds are brutal for several reasons: the change is usually quite sudden (60 at say 6am, to 90+ by 10am), and the air becomes extremely dry. With our latitude and the time of year, the strength of the sun isn’t helping anything. Sounds like great conditions for a ride then, right? Not exactly, and perhaps our attendance was a little lower this week due to the extended Santa Ana that started Tuesday and just didn’t seem to want to give up. The A&B groups were scheduled to head out to Bonsall to enjoy some country riding, and since it’s one of my absolute favorite places to ride, I really didn’t want to change the plans. The C group played it a little smarter and stayed closer to the shore where the Santa Anas began to lose their battle with the onshore winds. A fine looking bunch prepares to take off from Carbon Connection. 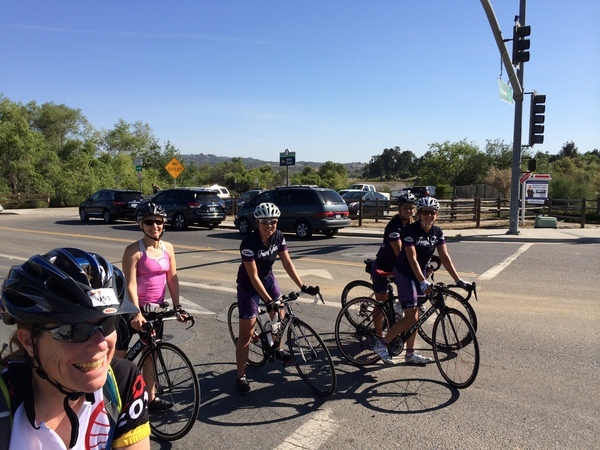 Since we had such a small crew, we decided to keep the four of us heading out to Bonsall together (Judy, Jeannine, Kim, and Heather), while Julie led Suzanne and Cele. Both groups started out by heading north to the San Luis River Bike Trail, which was fairly pleasant still at that early hour. We parted ways where the bike trail ends at the Mission Road/76 intersection with Santa Fe. 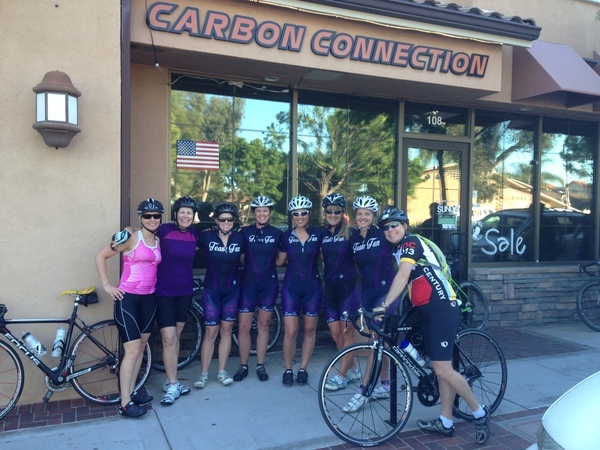 Team Fun @ 76/North Santa Fe – ready to tackle Lilac! I am a little ashamed to admit that none of us took a single picture for the rest of our ride. We had a short little stint on the 76 (with plenty of bike lane room on this part of the road, thankfully) until we finally arrived at the good stuff – the countryside! We turned off 76 onto Old River and finally arrived at the long, gradual climb that is West Lilac. This is a very interesting hill for me – I never know how it’s going to hit me. None of it is steep, but it sure is long (off and on climbing for almost five miles from the start of the road). Some days, I focus on how much “flat” it contains, and that seems to energize me. Other days, I focus on the length (or the heat, or the tightness in my hips, or whatever other ailment of the moment), and I feel like it’s completely arduous. Today, we were just “making it up” – not pushing yourself too close to your limits is key to your happiness and well-being on a ride in the heat, and so far we were all hanging tough. We regrouped and refueled near the big concrete bridge over I-15 (what some people consider to be “the top” of that climb), before continuing on the rest of the 4 miles of rollers until the intersection with Circle R.
Our original plan was to actually head out even farther north, down Shear’s Grade and out 76 eastward to climb Couser Canyon. Today was not the day for those kinds of heroics, so we came up with an alternate route to both originally posted routes that combined the best of both and ended up with a challenging 57 mile ride with more than enough climbing. We even got a little chance to keep up the reputation of Team Fun – we kept criss crossing with a mostly men’s crew doing a similar route, and we had a little fun on the rollers – enough so that we got some shouts of, “Team Fun doesn’t seem like they are a whole lot of fun!” Which I consider to be success! We only let loose for those few miles, than reeled in the exuberance for the remainder of the ride. Ascending Champagne is never fun, but in 95 degree heat, it is even less fun than usual. It’s not that it’s particularly long, and it certainly isn’t steep – it’s maybe because it’s neither of those things that it’s so darn frustrating. You always think to yourself, “It’s not that hard! I should be so much faster!”, but then you’re not. And it’s hot, and wait, what’s that person doing up ahead? As a somewhat grim reminder of the seriousness of the conditions, we encountered a rider who had succumbed to heat exhaustion. Fortunately, the rider had a couple of friends assisting her – but we took it nice and easy and made sure everyone had plenty of liquid to make it the 15-20 miles we had remaining. Thankfully, the rest of the ride was mostly flat and downhill, and as we came closer and closer to the coast, the cool ocean breeze refreshed our sunbaked bodies. I have to admit – I was still a little knocked out from that ride today! 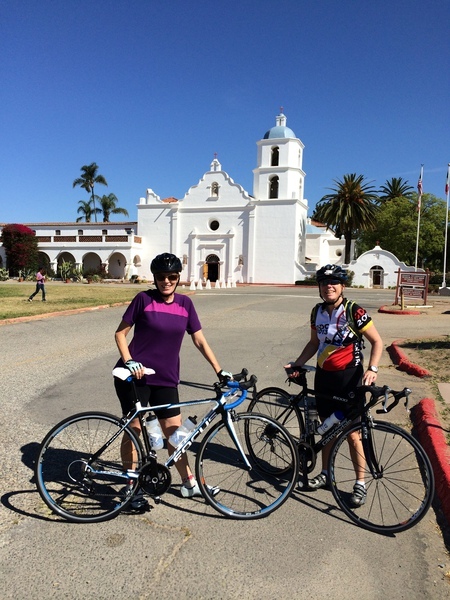 Meanwhile, Julie’s group explored some of the neighborhoods off the bike trail, and even found their way over to the Mission San Luis Rey. Cele and Suzanne at Mission San Luis Rey. We are looking forward to more normal temperatures for riding this week! Come join us next week when we take on May’s Monthly Climbing Challenge!